I found this recipe in the newspaper - LOVE the food section of the paper! - and I've been wanting to make it for a while. It's been hanging on the fridge since I found it. Thanks to my sweet friend Peggy, I have plenty of rhubarb (not that I wouldn't take more if it came available), so I made it last week. It was so good, I had to make it again this week for potluck. Place butter in a large bowl and beat with a mixer at medium speed until smooth. Add 2/3 cup granulated sugar; beat until well blended. Add vanilla and egg, beat well, then add milk. Combine flour, baking powder, cinnamon and salt. Beat into butter mixture until smooth. Combine rhubarb and remaining 1/3 cup granulated sugar in an 8-inch square baking dish coated with cooking spray. Spoon batter over rhubarb mixture. Bake in preheated 350° oven 45 minutes or until a wooden pick inserted into center comes out clean. Cool and sprinkle with powdered sugar. Serve with a dollop of whipped cream if desired. If fresh rhubarb isn't available, make it with frozen rhubarb, thawed and well drained. The cake is good either way, although it's moister and more pudding-like with fresh. I made it with fresh rhubarb the first time and with frozen the next, though I didn't completely thaw or drain the frozen rhubarb - so I guess we'll see. I'm not sure it was 'pudding-like' at all, even with fresh rhubarb. It was a very moist cake with a wonderful flavor! I had it with whipped cream the first time, but I didn't bother with the whipped cream after that. The cake is just perfect on its own. A little vanilla ice cream on top isn't bad, either. The original recipe called for mixing 2/3 cup sugar with the rhubarb, but I cut that in half because I believe you should be able to taste the tartness of the rhubarb. 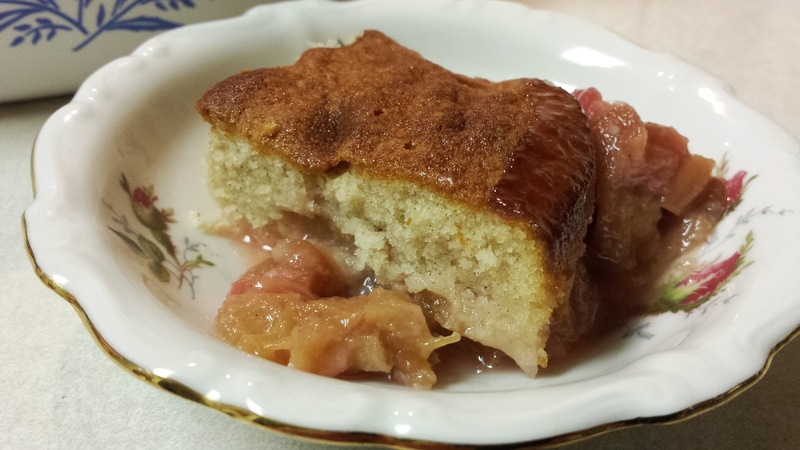 I love the burst of tart flavor from the rhubarb balanced against the sweetness of the cake. I hate that most recipes want to hide that tartness with so much sugar! If you're looking for sweet, then I think you should try something else, because rhubarb is tart, and that's what makes it special!